There was a good turnout for Fenland Rods last match of the 2017 season on the Six Islands Pool at Decoy Lakes. Dennis Sambridge made good use of fancied peg 17 with the wind blowing down the lake. He put a winning weight of 90lb to the scales all caught close in on pellet and worm, surprisingly taking mainly barbel throughout the day. Second was Mac Campbell, who drew peg eight and fished cat meat and corn close in for 85lb 4oz. Third was Dave Garner on 76lb 8oz followed by John Smith with 72lb. Hotpoint AC were yet another club fishing their last match of the year using the Elm Pool on the Decoy Lakes complex. 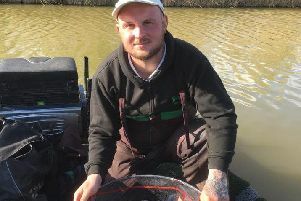 Some reasonable weights were taken with the in-form Pete Sanderson claiming a comfortable victory with 100lb 4oz taken from peg 16 at the more sheltered end of the lake. He fished a small feeder close in all day feeding carefully with a few pellets and fishing red pellet on the hook and caught carp to 8lb. Second from peg one was Tyrone Horn with 65lb 8oz and third from peg 11 was Larry Robinson with 63lb 15oz. The regulars who fish the Decoy Over 55 matches have been finding the fish of late and in their latest match spread over the Elm and Cedar Pool once again some very good weights were taken. On Elm, Steve Dorks fished maggot and pellet close in from peg seven weighing in 120lb 1oz, followed by Rob Edmondson on peg 11 with 118lb 12oz taken on the pole with pellet and later in the margins. Over on Cedar it was Stan Dow leading the way with 120lb 3oz from peg three. He caught on cat meat and sweetcorn down the margins. Runner-up with 112lb 6oz from peg one was Paul Parsons, who fished a pole and pellet line on the long pole. Third from peg nine was Simon Smith, who caught short on pellet for 88lb 11oz, followed by Ben Townsend on peg 25 with 87lb 4oz.